CCI-India will launch a national study of internal migrant workers, a media training program and the creation of a Cardijn Media company, the National Team has announced following its meeting at Trichur, Kerala this week. The 15-17 May meeting undertook an extensive review of the movement’s activities in India and the steps taken since the National Council in November 2011. SPSS (Statistical Package for Social Sciences) tool will be used for formulating guideliens and analysing the data collected. Two fulltime workers from CCI will be appointed for two to three months to conduct the survey in 6 major cities in India (Chennai, Mumbai, New Delhi, Pune, Bangalore and Hyderabad). One hundred families/individuals will be contacted during the survey in each of the six cities. Besides the six cities, CCI members will also take up the survey in their own areas. Two programs are to be held in Secunderabad from 7-11 July 2012. It was also decided to register Cardijn Media as a company. Six people have already agreed to subscribe for 10,000 rupees of shares. Under the proposed statutes, 50 per cent of any profits will be donated to CCI. 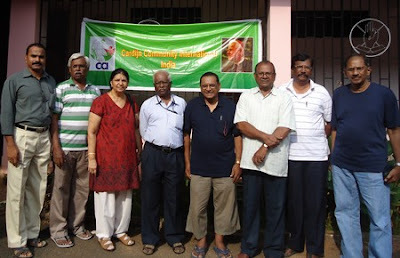 Among other decisions CCI – India formally decided to affiliate with the Cardijn Community International. National Team member Jomon Cherussery was coopted as national treasurer following the resignation of Monica Mascarenhas. It was also decided to open up for individual memberships with an undertaking by new members to endeavour to launch new CCI teams in their local areas within twelve months of their joining.